Answer: A, B, and D. RIP-2 and RIPng both use UDP, both use Distance Vector logic, and both use the same metric, with the same maximum (15) and same metric that means infinity (16). RIPng does not perform automatic route summarization because IPv6 has no concept of a classful network. RIPng also uses the built-in IPv6 authentication mechanisms, rather than a RIP-specific authentication such as RIP-2. Q2. Router R1 currently has no configuration related to IPv6 or IPv4. The following configuration exists in a planning document, intended to be used to copy/paste into Router R1 to enable RIPng and IPv6 on interfaces F0/0 and S0/0/0. No other related configuration exists. Which of the following is true about RIPng on R1 after this configuration has been pasted into R1? a. RIPng will be enabled on no interfaces. b. RIPng will be enabled on one interface. c. RIPng will be enabled on two interfaces. d. RIPng will advertise about prefixes connected to S0/0/0 and F0/0, but only send Updates on one interface. Answer: B. That the configuration will be copied/pasted into a router means that the order of the commands matters. In this case, that the ipv6 rip one enable command precedes the ipv6 address command on interface f0/0 means that IOS will reject the first of these commands, therefore not enabling RIPng on F0/0. The correct order listed under S0/0/0 means that RIPng will be enabled on S0/0/0. As a result, RIPng on R1 will advertise about S0/0/0’s connected IPv6 prefixes, and send Updates on S0/0/0, but will do nothing related for F0/0. Q3. Router R1 currently has no configuration related to IPv6 or IPv4. The following configuration exists in a planning document intended to be used to copy/paste into Router R1 to enable EIGRP for IPv6 on interfaces F0/0 and S0/0/0. No other related configuration exists. Assuming F0/0 and S0/0/0 reach an up/up state, which of the following is true about EIGRP for IPv6 on R1 after this configuration has been pasted into R1? 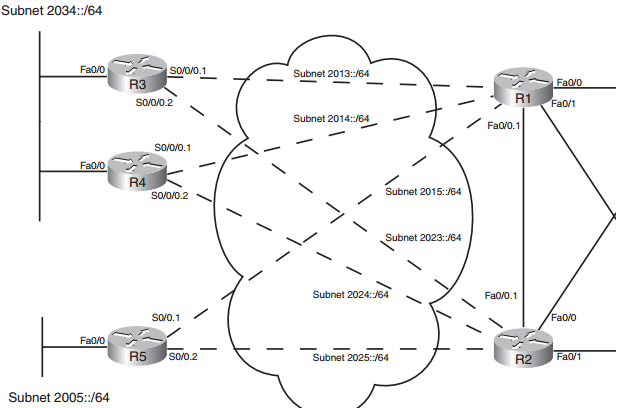 a. EIGRP works on F0/0 and S0/0/0 without further configuration. b. EIGRP works with the addition of one command: a no shutdown command in EIGRP router configuration mode. c. EIGRP works with the addition of one command: an eigrp router-id command in EIGRP router configuration mode. d. EIGRP for IPv6 needs at least two more configuration commands before it works on R1. Answer: D. Because the question states that no IPv4 configuration exists, EIGRP for IPv6 cannot derive a 32-bit EIGRP router ID. Before EIGRP will work, R1 needs to define an EIGRP router ID (using the eigrp router-id command) and enable EIGRP using the no shutdown router subcommand. Q4. Router R1 connects to Router R2 over an Ethernet LAN with both routers using their F0/0 interfaces. R1 learns a route from R2 using EIGRP for IPv6. That route lists F0/0 as the outgoing interface with R2 as the next hop. The configuration excerpt shows all relevant configuration on R2’s F0/0 interface. Which of the following is true about R1’s route? Answer: B. EIGRP uses the link local address as the next hop for routing protocols. Based on R2’s MAC address, R2’s link local address on F0/0 will be FE80::1311:11FF:FE11:1111. This value is derived by splitting the MAC, inserting FFFE, and flipping bit 7, making the initial hex 11 become hex 13. Answer: A and C. OSPFv3 supports multiple OSPF instances per interface, whereas OSPFv2 does not. Also, each version requires a different set of requirements be met before becoming neighbors, most notably that OSPFv3 does not require neighboring OSPFv3 routers to be in the same subnet. Q6. Router R1 currently has no configuration related to IPv6 or IPv4. The following configuration exists in a planning document, intended to be used to copy/paste into Router R1 to enable OSPFv3 on interfaces F0/0 and S0/0/0. No other related configuration exists. Assuming F0/0 and S0/0/0 reach an up/up state, which of the following is true about OSPFv3 on R1 after this configuration has been pasted into R1? a. OSPF works on F0/0 and S0/0/0 without further configuration. b. OSPF works with the addition of one command: a no shutdown command in OSPF router configuration mode. c. OSPF works with the addition of one command: an router-id command in OSPF router configuration mode. d. OSPFv3 needs at least two more configuration commands before it works on R1. Answer: C. Because the question states that no IPv4 configuration exists, OSPFv3 cannot derive a 32-bit OSPF router ID. Before OSPFv3 works, R1 needs to define an OSPF router ID (using the OSPF router-id command). Q7. The following output occurs on Router R1, which runs both EIGRP for IPv6 and OSPFv3, with redistribution from EIGRP into OSPF configured with the redistribute eigrp 1 metric 25 command. Interface S0/0/1 has been enabled for EIGRP ASN 1. Which of the following should be true of redistribution in this case? a. Route 2000::/64 will be redistributed. b. Route 2000:0:0:1::/64 will be redistributed. c. Route 2000:1:213:19FF:FE7B:5004/128 will be redistributed. d. No routes will be redistributed because of the omission of the subnets parameter of the redistribute command. Answer: A. The redistribute command does not have a subnets option for IPv6 because OSPFv3 has no concept of IPv6 classful networks nor their subnets. As configured, the redistribute command redistributes only EIGRP-learned routes. If the includeconnected parameter had been included, the connected route for 2000:0:0:1::/64 would have also been redistributed. Local routes are never redistributed. Q8. Router R1 has been configured with an ipv6 route 2000::/64 S0/0/0 64 command. Which of the following does the 64 at the end of the command represent? Answer: B. The only configurable item after the interface that does not first list a keyword is the administrative distance parameter.